What do you use INSTEAD of the Slow N Sear? - Page 2 - The BBQ BRETHREN FORUMS. What do you use INSTEAD of the Slow N Sear? When you pile the hot coals up on one or both sides of the kettle, do you not ever have any problems with the extreme heat messing up the porcelain finish on the outside of the kettle? I have always been concerned with that possibility. I was just looking at 26" kettles online. If I was to take a short road trip, I could have one today. Going on 39 years for one of my kettles, I'll let you know if it ever happens. the charcoal to collect drippings. Sounds like Weber is OK with it. I made my own basket out of expanded metal. Works great. Makes it easy to shake out ash, and the small holes work better with lump, which I use exclusively. No welding to make it either. Bottom and "back" (the flat side) are one piece, just bent the side up. The curved side is bolted to the back, and tied to the bottom with wire. Click on "Find at another store" and enter your zip. Some of the hits say "Available for pickup as early as today" I'd call first, cause I'm not the trusting sort. I was looking at an old computer to see what was on it and found this. It's from a old post here. 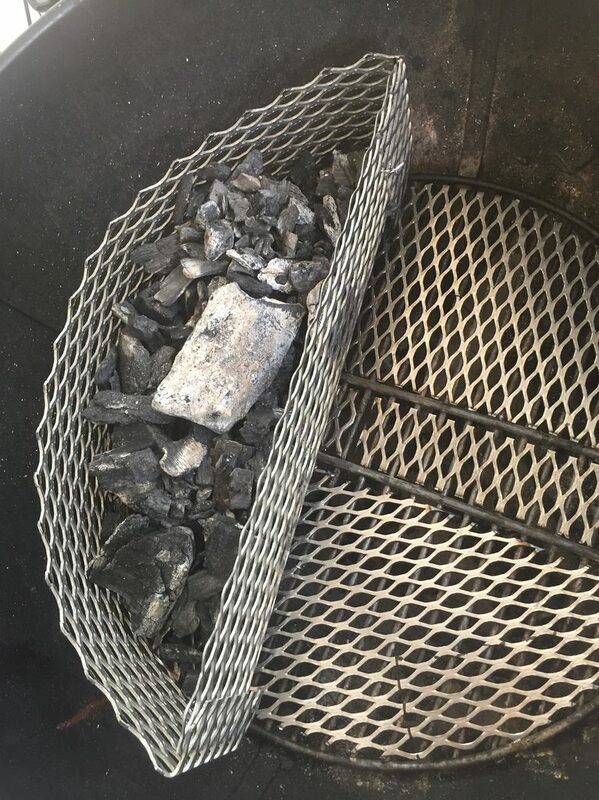 Had to fill the bird feeder, so I snapped a pic of where the coals set on the side.